At the recent prizegiving Gabrielle Telfer also touched on the TTNZ Nationals event and the great results and team spirit she observed. 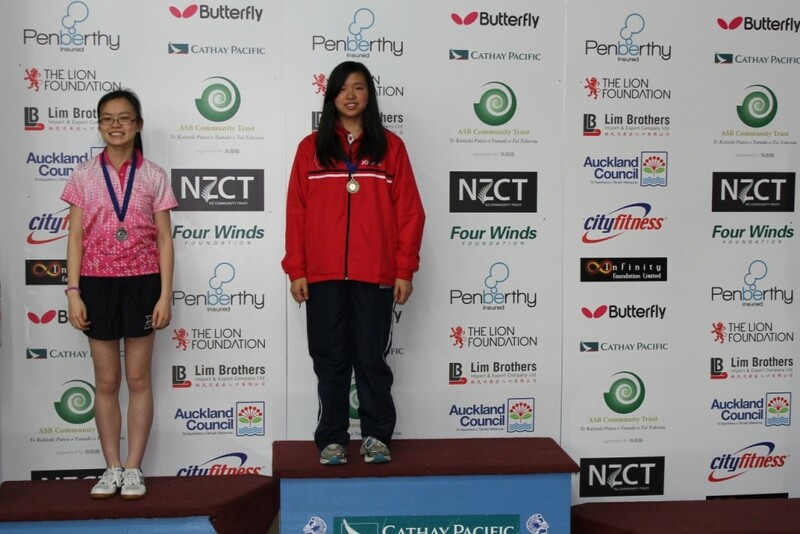 Below are reports from both her and Malcolm Wong on the Nationals including photos! No I don’t mean the event itself but the way our young ‘A’ team stood up and played their hearts out to finish 6th in the A grade of the Senior National Championships Teams event. Chun Kiet Vong, Frank Fu and Sean Hanson, captain Ben Collins and coach Hayden Tapp be very, very proud of yourselves. We are. It all started with the grading match against Waitemata at 8.30am on Wednesday morning which our team won 4-2. This win put the team into Group 1 of the A grade, which brought with it the challenge of three more rounds in that same day. It was no mean feat to play four matches of that intensity over 14 hours. The next match was against Manawatu at 11.30am which our team narrowly lost 3-4. At 2.30pm they faced Canterbury going down 2-5 and the last match of the day was against the eventual winners of the competition Auckland 1 who managed to scrape in against us 7-0! However there was some outstanding individual and doubles play in all of these matches, where sets were taken off players such as John Cordue and other New Zealand representatives. The next morning we found our opponents in the crossover round for places 5-8 was North Harbour. These games too proved to be tense and thrilling encounters, and again our team rose to the challenge. The strategy devised by Hayden and Ben proved to be the difference between the two teams and Wellington came out of the match with a 4-3 win! This result brought us to the 5/6 playoff against Waikato which we lost 4-1. A sparkling doubles match played by Chun Kiet and Sean ensured it wasn’t a complete whitewash. This result I can assure you was a true reflection of just how much energy and passion these four players had put in to their five previous matches – by the end of this one they individually and collectively had nothing more to give. A personal highlight for Sean was taking a Waikato player who is also a current New Zealand Junior representative to 5 sets only to lose it 11-13 in the 5th. For three young players, two of whom had never been to a Senior Nationals before to pull off the kind of results they did was nothing short of superb. It was a privilege to witness the heart and soul all four players put into their individual games. They certainly left everything on the table! The team was very ably captained by Ben Collins who led from the front. The team was exceedingly well coached by Hayden Tapp. Ben and Hayden together made strategic decisions that paid off and enabled the team to win games and matches that led them to the playoffs for 5 and 6. When these players were selected, I wrote in each of their selection letters ‘I look forward to our Wellington players representing us with passion and pride’. They certainly did that. Rather unfortunately our ’B’ team was placed in Group A of the B Grade which was well above their collective strengths. However Depak Patel, Gareth Telfer and Paul Solt turned up and played all their matches with much enthusiasm. Unfortunately their results took them to the 7/8 playoff where they again met the Canterbury team and again came second in that match. There were individual victories along the way and all matches were played in a good spirit. Thank you Depak, Gareth and Paul for the heart you all showed, even though you were well out of your depth. You too represented Wellington with passion and pride! A thank you also to Malcolm Wong who surprised us in Auckland – Malcolm helped support our teams and took the team photos for us. Wellington was also represented in the Women’s competition with Hui-Ling Vong playing in a Presidents team with Natalie Paterson and Tetyana Sulimova. The Women’s grade consisted of five teams who played a round robin. There were two Auckland teams, one Canterbury team and two Presidents teams. In the Individual events three players competed, Ben Collins, Chun Kiet and Hui-Ling Vong. Hui-Ling won the Women’s B Grade and together with Chun Kiet, they were runners up in the Under 21 mixed doubles. Ben finished third in the Men’s B Grade as well as reaching the semi finals of the Over 30 grade. Well done all of you – I look forward to what 2015 brings! 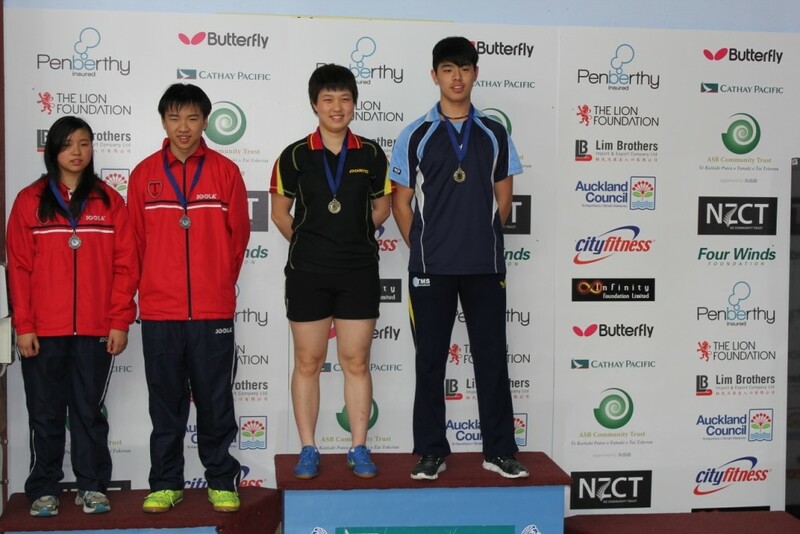 Wellington entered two Men’s Teams and Hui-Ling Vong was in the draft for a Women’s Team in the New Zealand Championships held in Auckland. Wellington Men’s 2 were in B Grade. Wellington Men’s 1 played in a grading match against Waitemata 1 to decide if they would be in A or B Grade. Wellington 1 beat Waitemata 1 by 4-2. Ben Collins won both his singles and the doubles with Sean Hanson. Chun-Kiet Vong clinched the match beating Max Rogers 3-2. 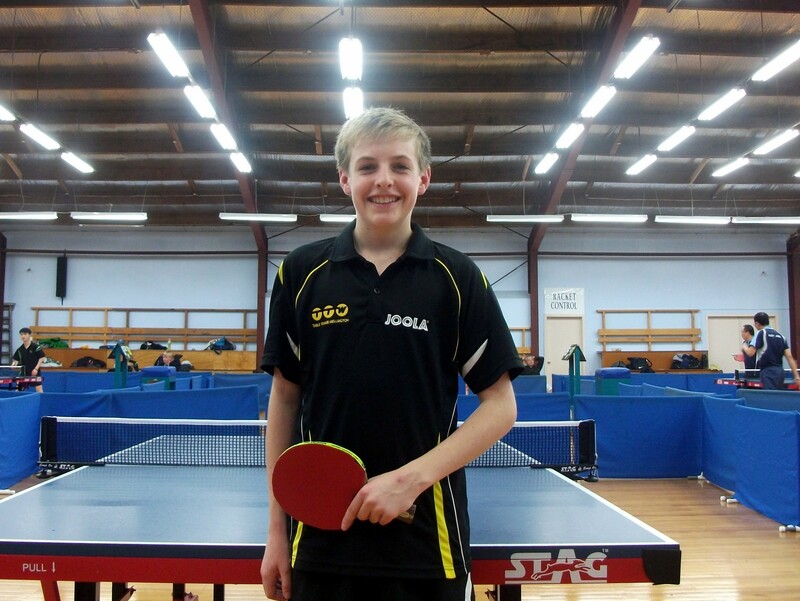 In A Grade Ben Collins was the mainstay of the team winning 5 of his 9 singles, which included winning both his matches against Manawatu and North Harbour. Two of his losses were in 5 games. The juniors found the going tough with Sean Hanson (2/6), Chun-Kiet Vong (1/6) and Frank Fu (1/ 7). 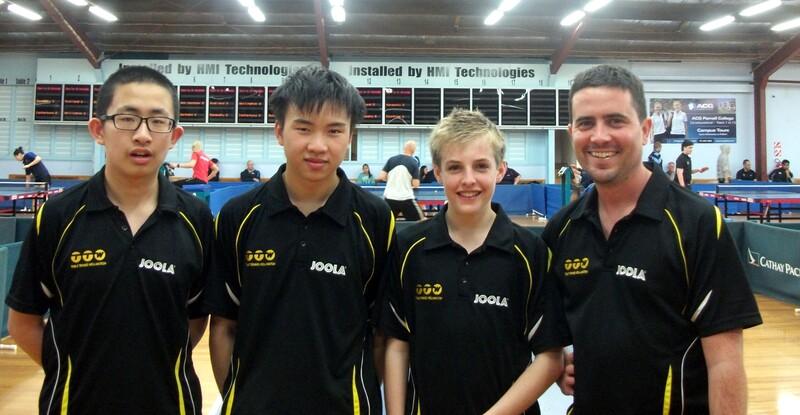 The only doubles win was by Sean Hanson and Chun-Kiet Vong against Waitako, with Ben Collins/Sean Hanson (0/4). Thanks to Hayden Tapp who coached the team. Frank Fu, Chun-Kiet Vong, Sean Hanson and Ben Collins. The withdrawal of Robert Chung seriously weakened the team and they would have been more competitive in C Grade. 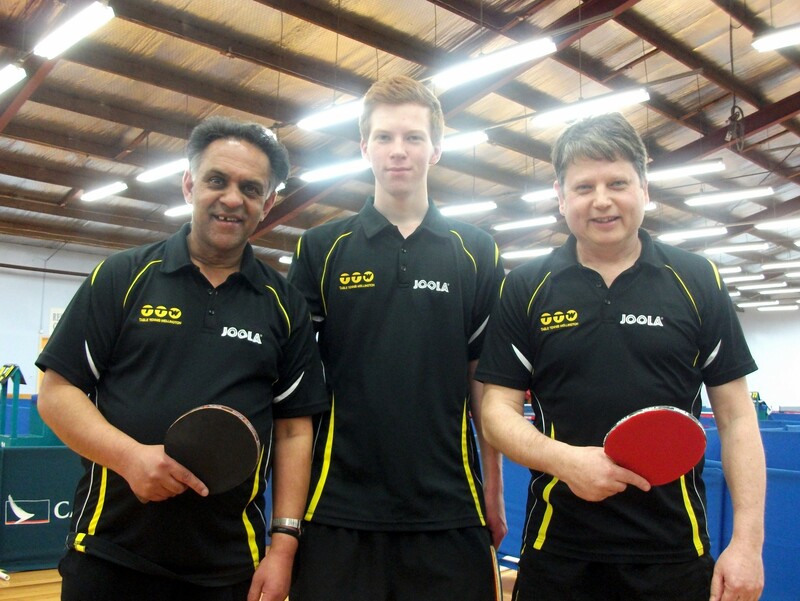 Depak Patel won 4 out of his 10 Singles with Paul Solt (1/10) and Gareth Telfer (0/10). The Doubles were much better with Depak Patel and Gareth Telfer winning both their doubles matches, and Depak Patel/Paul Solt (2/3). In the first match against Canterbury 3 Paul Solt lost his 2 singles in the 5th (14-16 and 10-12). If he had won both those singles the team would have won the match. Depak Patel, Gareth Telfer and Paul Solt. Hui-Ling Vong played for Presidents 1 (with Natalie Paterson and Tetyana Sulimova) which finished 4th in the Women’s A Grade Teams. She won 3 of her 8 singles matches and 1 of her 4 doubles. In the Open Men’s Singles Group Chun-Kiet Vong had a good win against Craig Dye 3-1 and qualified from his Under 21 Men’s Singles Group by beating the higher rated Bryn Lindsay 3-0. Ben Collins reached the semi finals of both the B Grade Men’s Singles and Over 30 Men’s Singles. Ben beat Craig Dye 3-0 in the last 16 of the B Grade Men’s Singles but lost to Craig 1-3 in the semi finals of the Over 30 Men’s Singles. Hui-Ling Vong won the Women’s B Grade Singles against Maggie Ngo 3-0 and reached the semi finals of the under 21 Women’s Singles. Chun-Kiet Vong and Hui-Ling Vong were runners up in the Under 21 Mixed Doubles. International Umpire Malcolm Wong was involved in the judging of the Junior Boy’s Umpiring Award (Alan and Edna McCallum Junior Umpiring Awards). He umpired several matches including a Men’s Singles semi final and the Women’s Singles final. Maggie Ngo (Silver), Hui-Ling Vong (Gold). Hui-Ling Vong, Chun-Kiet Vong (Silver), Guiting Lu, Victor Ma (Gold). 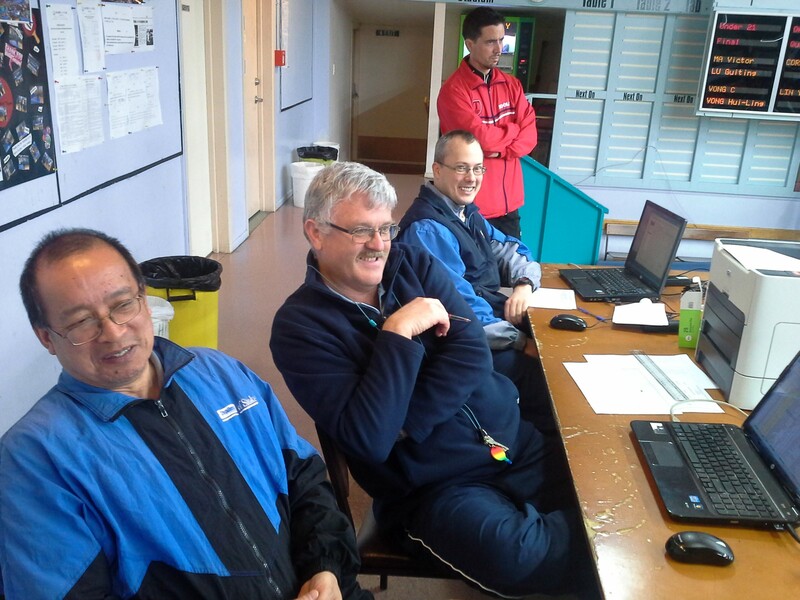 Malcolm Wong, David Jackson (Referee), Shane Warbrooke (Director) and Ben Collins.